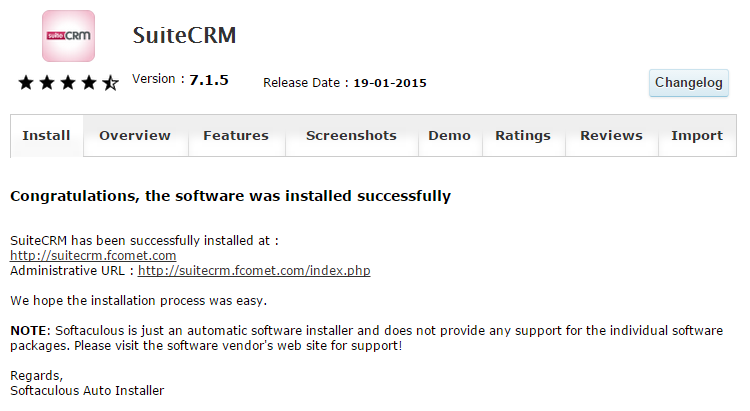 This tutorial will review the installation of SuiteCRM via the Softaculous auto-installer. This is the easiest way of installing the application, as it takes a few clicks for a full completion. To help you get started with SuiteCRM our Technical Support team provides Free SuiteCRM Installation. The first step is to access the Softaculous service. It is available on all our SuiteCRM Hosting plans and you simply need to access your cPanel account. Locate the Software and Services section and click on the Softaculous icon. You will be presented with a list of all applications available for install via Softaculous. They will be categorized on the left side of the screen, depending on their functionality. In the search bar, enter SuiteCRM and click on the application. You will be taken to a brief description of SuiteCRM and what it does. You will be able to review a live demo of the script, ratings, screenshots and much more. If you decide to proceed with the installation, simply click on the Install button. Choose Protocol: Choose the protocol to be set on your website. NOTE: Do you choose the secured https protocol if you do not have an SSL certificate installed for your domain. This is a paid service you can get via your Client Area. Choose Domain: Select the domain you will use for your new SuiteCRM installation. If you have any addon or subdomains on your account, you will be able to select them from here. In Directory: This option allows you to install the application in a subfolder of your account. If you wish to install it directly on your domain, simply leave this field blank. Database Name: Enter the name of the database to be used for your new installation. The system will automatically create it for you. Site Name: Enter the name of your website. This can be changed easily later. Admin Username: Set the administrative username for your website. Make sure that you keep that safe as you will need it for managing your website. Admin Password: Enter the password for the admin user on your website. First Name: Enter the first name of the administrator. Last Name: Enter the surname of the admin user. Admin Email: Enter the email address of the administrator on your website. When you are ready with all of the options above, simply click on the Install button. The system will initiate the installation for you within a few seconds. Upon completion, you will receive a successful message, displaying the details of your new website. Keep them safe as you will need this information in the future.